The chevron pattern seems to be a new trend in fashion and design. 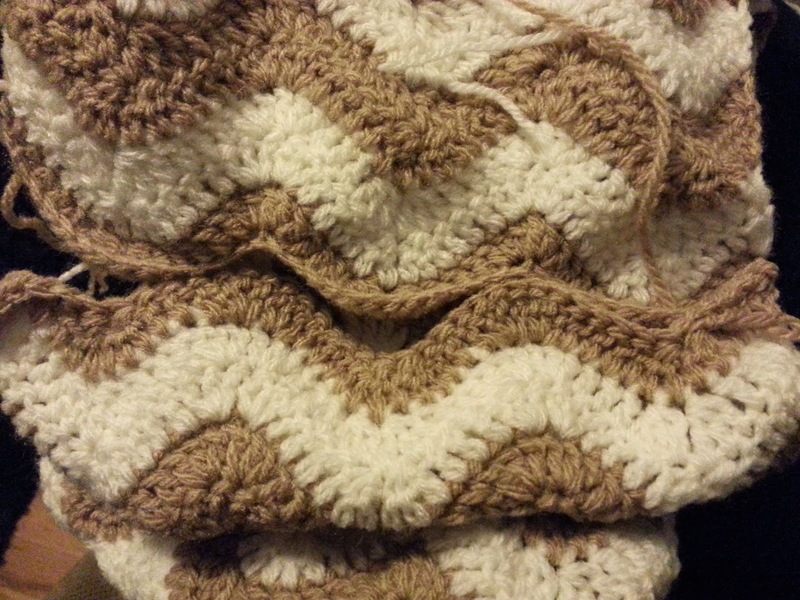 I've seen a few chevron scarves around, so I figured it was time to write a pattern for it. This adorable scarf will be perfect for fall and winter, and it would make a lovely, personal gift for the holidays. I'd like to try this pattern out with different yarns/weights, too, for different effects. I love this pattern because it becomes mindless after a while once you starting repeating the same row throughout the scarf, so it's perfect for cuddling up by the TV or taking it to-go! I love anything with stripes, and this chevron pattern is the perfect twist on the traditional stripe. I love the neutral colors and their ability to go with any color, but you can make it with any colors you like, with varying stripe widths too. You may sell the finished product from this pattern, but please reference and link this post. Please don't claim this pattern as your own or sell the pattern. I'd love to see pictures of your finished product! You can put them up on Ravelry or post it on my Facebook Page. You can also purchase this scarf from my Etsy Shop and customize the color/design. Matching chevron beanie pattern now available to go with this lovely scarf! 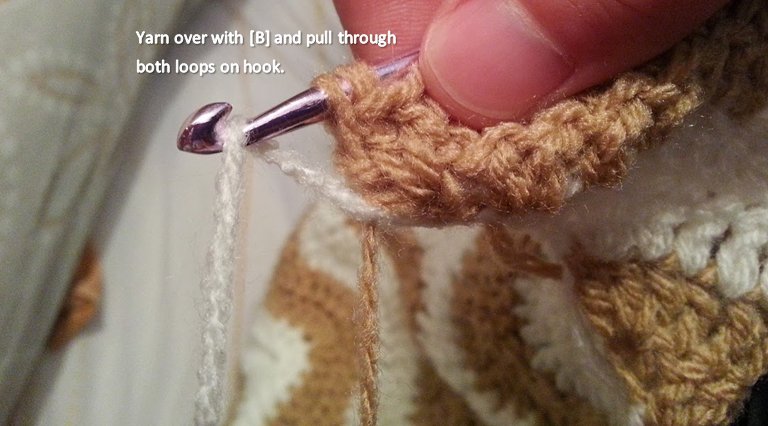 Yo, insert crochet hook into 1st stitch. Yo, pull up a loop. Yo, pull through 2 loops. Yo, insert hook into 2nd stitch. Yo, pull up a loop. Yo, pull through 2 loops. Yo, insert hook into 3rd stitch. Yo, pull up a loop. Yo, pull through 2 loops. Yo, pull through all 4 loops to complete the stitch. 3 stitches have been decreased to 1. I carried the colors on the sides and put a border around the scarf, so you can't even tell. It saves a lot of time (and yarn)! There are so many different techniques for the chevron/zig-zag/ripple (whatever you want to call it) stitch, so this scarf can be made in anyway that you like. 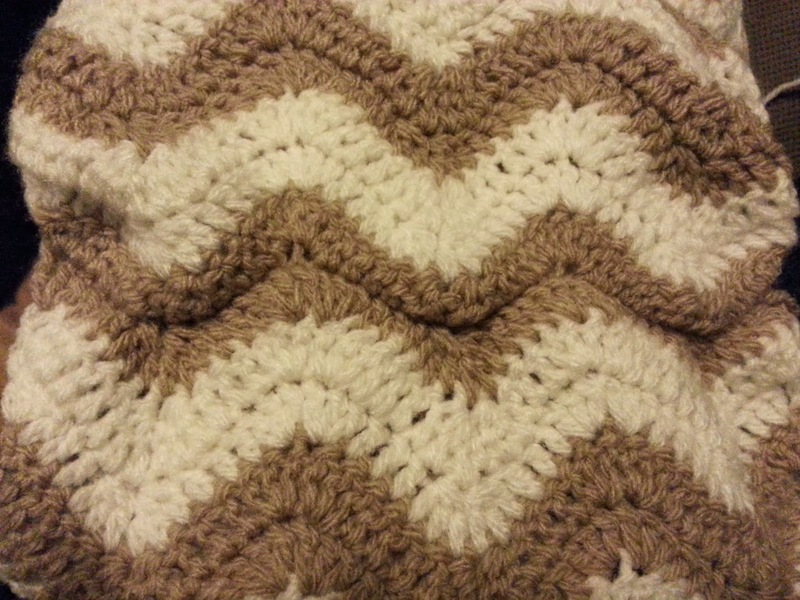 I like this technique because the ripples are sharp and I, personally, don't like the eyelets in the chevron stitch. With [A], ch 44. This stitch requires a multiple of 14+2, in case you'd like to make this a blanket or something wider than a scarf. 2 dc into third ch from hook. *Dc into the next 3 ch. (dc3tog in next 3 ch) twice. Dc into next 3 ch. (3 dc in next ch) twice. Repeat from *. Dc into next 3 ch. (dc3tog in next 3 ch) twice. Dc into next 3 ch. 3 dc in last ch. Switch to [B] (see pictures for color change). Ch 3 and turn (Ch 3 acts as a dc here and throughout). When carrying the colors on the sides, you just drop the color you were working with, and pick it up when you need it again after completing two rows. 2 dc into first dc. *Dc in next 3 dc. (dc3tog in next 3 dc) twice. Dc in next 3 dc. (3 dc in next dc) twice. Repeat from *. Dc in next 3 dc. (dc3tog in next 3 dc) twice. Dc in next 3 dc. 3 dc in top of ch 3. Ch 3 and turn. Repeat Row 2 alternating with [A] and [B] every 2 rows. Continue this pattern until the scarf is the desired length. Make sure to end with just 1 row of [A]. When the two ends are stitched together, it'll make 2 rows of [A]. Do not fasten off when finished. Bring the end to the beginning being careful not to twist the scarf. Sl st the ends together to make a circle. Make sure the peaks and valleys match on each end when stitching them together (see pictures). I stopped once in a while to make sure they were still lined up. Make sure to go through each stitch on both ends. This will leave a seam, but when you flip the scarf inside-out, you can hardly see it. You can also sew the ends together with a tapestry needle. Sl st in both loops of each end. Make sure the peaks match the valleys. Using [B] that is still attached to the scarf, ch 1 and evenly sc around. Sl st with beginning to join. Fasten off. Join with a sl st on the other side and repeat. Weave in all ends with tapestry needle. Please let me know if you have any questions about the pattern! I just came across your page, through finding this pattern on Ravelry, I love that you have guinea pigs, sounds like my life.. Crochet and guinea pigs, hahaha. I have tried a few chevron patterns and they did not come out very well. I like your pattern, mine came out great. 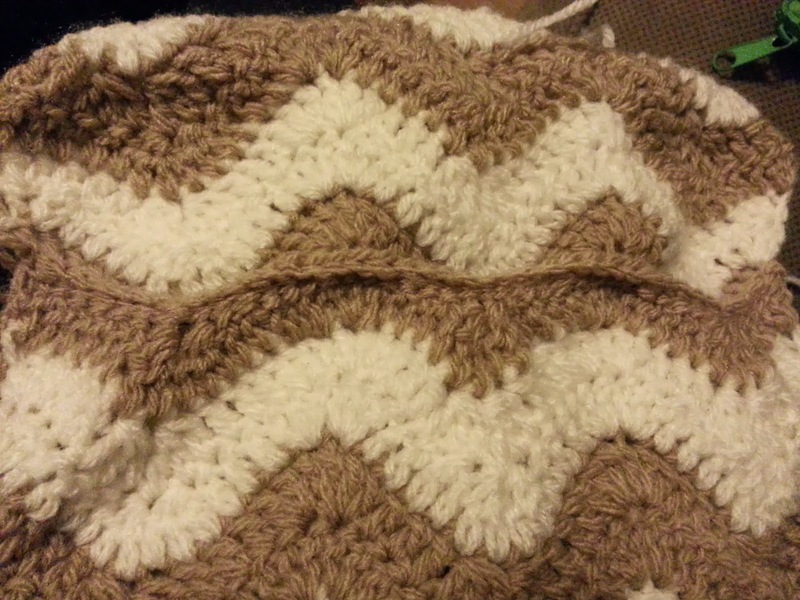 I made mine in six row intervals to make big solid stripes, but i like the narrow ones you did as well. I did not like carrying the yarn across the side though, because with contrasting colors they are peeking through (also I had a few mishaps where my yarns got tangled, but I know that was just my fault!). I think I will try cutting them and running them along as you switch colors (rather than the sewing them in). 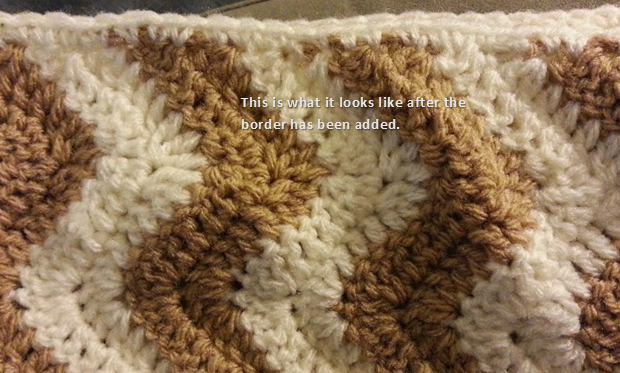 I might also see if I can make this with a single crochet, to make it more sharp. Having said that, I am so grateful for this pattern! This is the first one I found that worked so well! THANKS!!! Thank you for your comment. I'm glad the pattern worked well for you! By all means, do whatever method works best for you when switching colors. Thanks for that suggestion, I will try that next time. Would you mind sending pictures of your finished product? You can post them on my Facebook page or on Ravelry, if you have one (links on the right column). Or post a link in the comments. Let me know how the single crochet works, I'm sure that would look great! Happy crocheting! Love your patterns! I wanted to thank you in advance for this particular one. 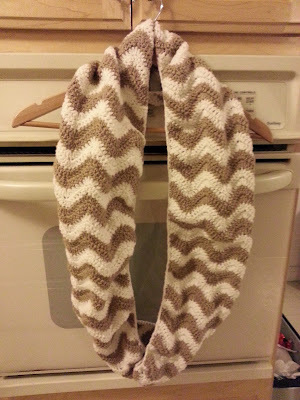 I've been looking for a pretty/easy chevron infinity scarf pattern & this one is perfect! One question: How many rows are on your scarf? You're welcome! Thank you for the comment, I'm so glad that you like it! My scarf has 112 rows. I love this scarf and am excited to start on it. I had quite a bit of trouble finding the yarn you used or any size #3 in the colors I wanted. So I purchased a satiny #4 yarn but am concerned about the proper gauge. Should I just increase the hook size to a H? Any suggestions? You can use any size yarn, really for this pattern. But yes, you are correct: you should increase the hook size as well. For #4 yarn, I'd use an H hook. Let me know how it turns out! Please post pictures on Ravelry or on my Facebook page! Finished my first one using the recommendation above and gave it as a Christmas gift - she LOVES it! Now I'm on to my next scarf (for me) in another color. Thank you for the pattern! It looks fantastic! You did a great job on the scarf! Thanks for posting the pictures, I'm so glad you enjoyed the pattern. When you say chain (or double chain) three before you turn, how do I do that since I've completed the row, It that makes any sense. There are no more stitches for me to double from. Thank you so much for your pattern! This is my first project that I'm taking from reading a pattern or that has any sort of special stitches!!! When you complete the row, chain 3 and turn the scarf around to start the next row. The chain 3 acts as the first double crochet. I hope this helps you. Please let me know if you have any other questions about the pattern, and I will try to help you as best as I can! I used this pattern last week and it turned out really nice! I love it. Thank you for sharing. Any ideas on how to make a matching beanie? Again, thanks for the awesome pattern! Thanks for the comment! I'm really glad that you liked it. If you can, please post pictures of your scarf. I'd love to see it! You can post the link to it here in the comments, or post it on my Facebook Page (www.facebook.com/crochetfromj). I will work on a chevron beanie to match, thanks for the idea! Thanks Hollie! I saw it, you did a fantastic job on it. I love the multiple colors. When my scarf is folded in half after it's been joined, it is 31.5 inches long. I did 112 rows. Hope this helps! I just made this for my Daughter, very easy pattern to follow, thanks for sharing the pattern! You're welcome! I'm glad you like it, and I hope your daughter enjoys her scarf. If you can, please post pictures of the scarf you made--I'd love to see it! Hi! I made 4 of these for Christmas gifts for my sisters, mom, and sister in law! They turned out adorable! I want to make one for my 5 year old daughter, but I think it is too wide for her. I am struggling to understand what you mean by 14 +2. Any advice would help! Thank you! I'm glad you enjoyed the pattern! I would love if you posted pictures of the scarves you made. You can post the link here, or post the pictures on Ravelry or on my Facebook page (www.facebook.com/crochetfromj). When I say 14 +2, chain a multiple of 14 and then add 2 to that. In the case of my pattern, I say chain 44 (14 x 3 = 42 + 2 = 44 chains). So if you want to make a scarf that's narrower than mine, try 30 chains (14 x 2 = 28 + 2 = 30 chains). Hope this helps. Let me know if you have any other questions and I'll try to help as best I can! Hi there! I love this pattern and I'm almost done my scarf. I'd love to make a blanket next but I don't understand what the 14+2 is. I just started this beautiful pattern and I've found it super easy so far! Only problem I'm concerned with is how wide is your scarf? Mine is nearly a foot wide. Yours doesn't look nearly that big! For reference, i'm using a weight 4 yarn with an h hook. Thanks for making such an easy and beautiful pattern. I'll be sure to post it on your Facebook page when it's finished! My scarf is nine inches wide. I used sport yarn and a size G hook, so if you're using 4 yarn with an H hook, it's gonna be a lot wider. Maybe you can try using a smaller hook with the 4 weigh yarn, perhaps E or F? But if you'd like it smaller, the best thing would be to use 2 or 3 weight yarn. I hope this helps. I'm glad you find the pattern easy! I like crocheting with two strands of yarn, so If I want to use a larger hook how much do I need to take away from the initial chain 44 to reduce the width ? Try chaining 30. I think that would make the width reasonable when crocheting with two strands. Found this through Ravelry. Just started and it looks really nice. Thanks for such a great pattern. You're welcome! I'm glad you like the pattern. Please post pictures of your finished scarf. I'd love to see it! 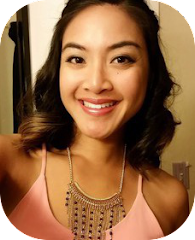 Classy infinity scarf, thanks for sharing! Hope mine comes out as well as yours. I'll be using a camel color and a Khaki green...wish me luck! You're welcome! Can't wait to see your beautiful scarf! 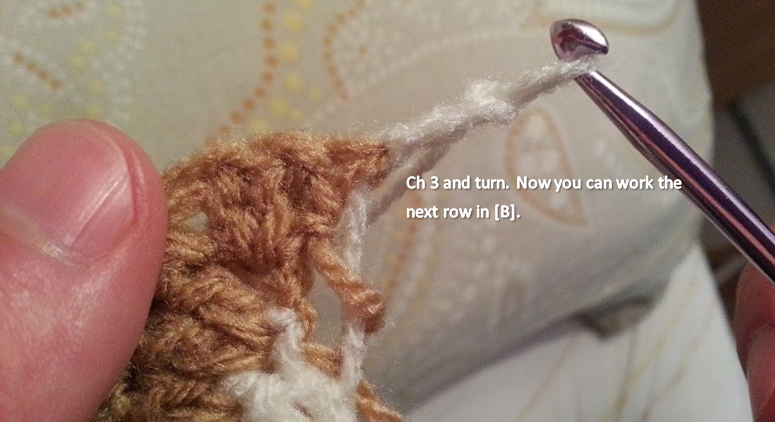 Make 3 double crochet into the top of the chain 3 from the previous row. The chain 3 at the beginning of each row acts as a double crochet. So instead of making the last stitches of the Row (3 double crochet) in a double crochet, you will be making it in the top of the chain 3. Hope this helps. I am not able to do the 3dc at the end. Also, I see you do the 3dc in one chain twice to get the valley or peak. What am I doing wrong? Can you send me a picture of what you have so far so I can see what went wrong? I figured it out thank you. When I got to the third row at the end I can't do the 3 dc in the three dc. It leaves one dc. How many stitches did you end up with on second row? 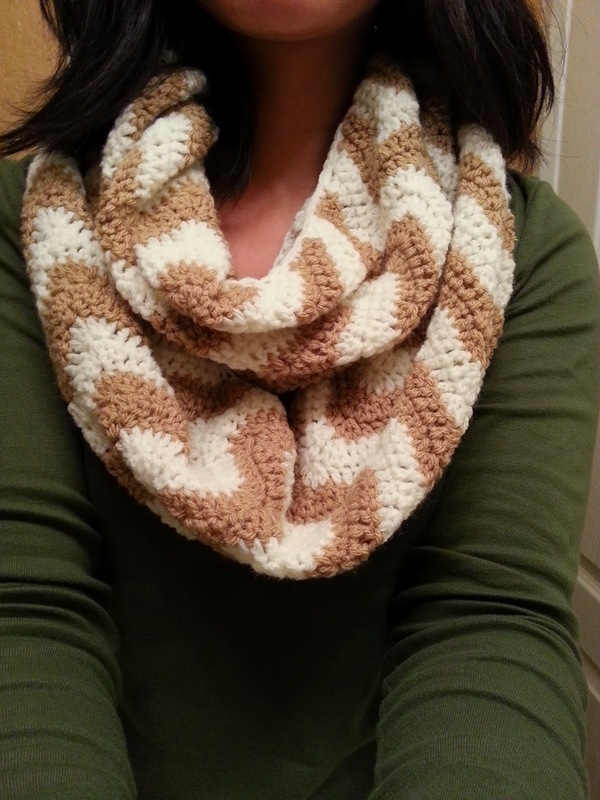 do you have a printable for this pattern?...my friend would love this and she don't have the internet..she has me constantly looking for different scarf patterns. Sure, you can send me a message below and I'll email the pattern to you so you can print it. I have made my mom a scarf, myself an afghan, my great-granddaughter a small afghan and my granddaughter a baby blanket for her soon to be born daughter. I enjoy crocheting this pattern. I use a J hook and just add 14 extra for each section. I would post pics but I have given them to my loved ones already. Thank you for the use of your pattern. I'm so glad you enjoy the pattern! Thanks for the comment. I will have to share a picture of my sisters-in-law wearing their scarves the next time I get them both together. Thank you for the comment! You're welcome, I hope you enjoy making the scarf as much as I did. I don't wear scarves, but I making it for my daughter in law. How long did you make this one? I think that would be a good length for her. Thank you so much for the pattern! When my scarf is folded in half after it has been joined, it is 31.5 inches long. I did 112 rows. Hope this helps! I really like the colors you used. I can't seem to find it in our stores or on line. Can you tell me where I can find it on line? I got mine on Amazon, but they don't seem to have a great color selection any more for Red Heart Designer Sport yarn. A good alternative sport yarn is Lion Brand Baby Soft, or Lion Brand Vanna's Glamour. You'll definitely have more luck finding those in stores or online. Hope this helps! I have taken it out and have redone row 1 three times. I keep ending up with 2 stitches after my last three single dc. I'm sorry you've frogged it so many times. Make sure your initial chain is a multiple of 14+2 and that you're making the first two dc in the third ch from the hook. Also make sure you're repeating instructions twice where it indicates. I know some people had that issue. Keep trying! Hope it works out! I start by chaining 44, and then my row 1 ends perfectly (42 stitches in total after the final 3 double crochets in the last chain). Row 2 always ends with only a total of 41 stitches, so that I cannot place the final 3 double crochets in the top on the first chain 3. Can you please help? 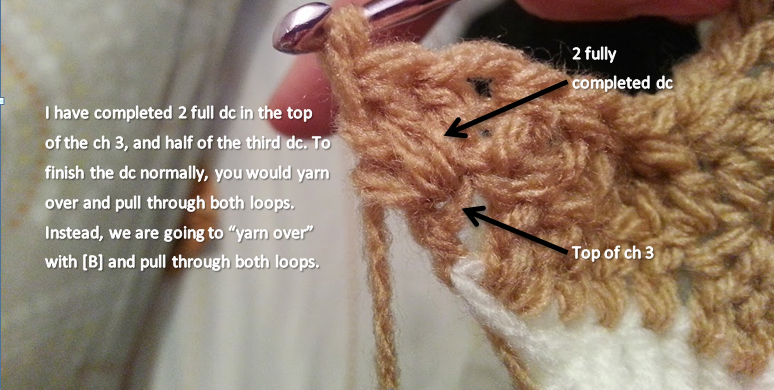 Sometimes the ch 3 can be difficult to see and make stitches in. Keep trying! I know it can be frustrating, but it sounds like you've got the pattern down if Row 1 ends perfectly. If you want, you can message me (either on Facebook or the Contact Me page) a photo of what your Row 2 looks like and I can try to see what's going on. The designer sport yarn is part of the title of the brand of yarn I used. Sport refers to the weight of the yarn. You can use worsted weight as well, but I would use a smaller hook so that your scarf isn't so large. 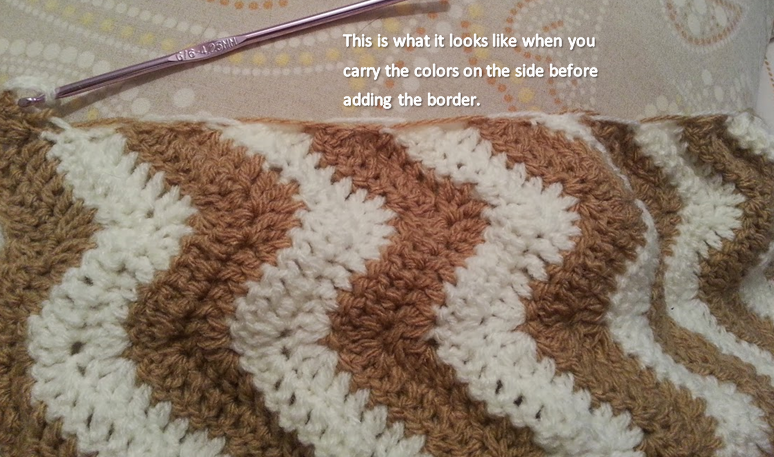 I just used A & B to depict each yarn color throughout the pattern so I didn't have to type it out each time. A represents the tan color and B represents the white color. Just wanted to let you know that I made this and it turned out just like the picture you posted, had lots of compliments on it today at work, I love it, it was very easy to make, I had never not tied off the yarn when changing colors before, but that was so much easier to do, so THANKS for the pattern and the pictures, I would post picture's but don't know to do that, I can crochet and knit but not to good at technical stuff, sorry, but love the scarf. Could you please email me this pattern so that I can print it? I am disabled and have to lie in bed all the time and it is easier to crochet when reading from a printed pattern. Thank you so much! The pattern is just so beautiful and I can't wait to start it! I am going to make it for my nurse's aide. Thank you so much! Here is a link to a printer-friendly version of the pattern. Happy crocheting! Could you email me a copy of the scarf and hat beanie. I love making hats and scarves and give away as gifts. But it's easier for me to have a hard copy. Thanks so much. I am going to make scarf in eggshell and tan. Will post pictures when I complete. Im a bit confused on how to switch colors the first time, do I cut A and slip stitch it or leave it and start the next row with B? You don't need to cut A, just leave it and start with B. Make the color change before you complete the last dc in the row. You can pick up with A again in the next color change. 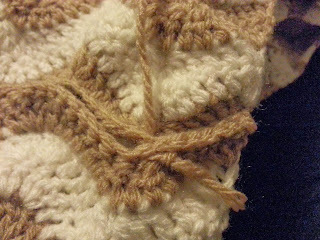 I perform those stitches twice to make the chevron "valleys" a little deeper and to eliminate the eyelet. Glad you're enjoying the pattern and love your finished product! Hi! I started the pattern and it is not getting the ripple effect, instead it has formed a circle. I also ended up with 2 leftover chains after row 1. I'm not sure what is going on. It looked like a ripple after row one but after row 2 it took the shape of a circle. Any help/suggestions would be appreciated. Thanks! Can you send me a picture of your work through Facebook? I may be able to better help you if I have a picture to reference. I know not getting through a pattern can be pretty frustrating, so hopefully I can help! I figured out what was going on, after looking back over the pattern alot. I was working the dc3tog wrong. I had another pattern that was worked as a dc3tog but all in the same stitch and I kept trying to do it that way instead of the correct way. Now that I figured it out the pattern is absolutely beautiful! Im sorry, I really wanted this to work. I have tried 4 times, and just cant get it right! So frustrating. Which part are you having trouble with?